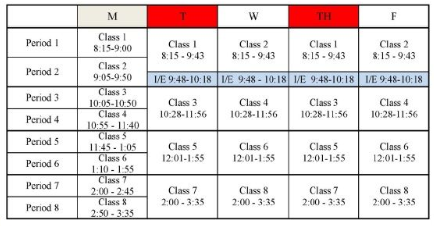 Many are surprised to learn that in 1995, West Ottawa operated on the block schedule, also known as the “Cadillac of schedules.” It is a luxury that comes with a high price tag, but allows both teachers and students more time to dig into a lesson and process the information. With a block schedule, classes are 90 minutes and students attend four of their subjects one day, and the other three the next day, still learning the same material but throughout longer, spaced out periods. Twice a week, there is an hour long seminar, and once a week, a “speed day” where students attend all 7 classes. Though expensive, the block schedule is a great structure with only a few drawbacks. The block schedule offers teachers the opportunity to develop their lesson plans by implementing more creative projects and interactive activities. These are necessary to keep students interested for the whole 90 minutes of class. Nonetheless, having so much time to focus on a single subject helps students retain the information better: “I think it’s much less stress on your brain, allowing for mental breakthroughs on a math concept or finding a writing groove because you have 1 ½ hours to learn rather than 50 minutes,” Annika Barber, a student at Black River High School, said. Not only does productivity seem to thrive in the classroom, but at home. Only having homework from three or four classes each night is reasonable, allowing students to actually spend time studying instead of scrambling to finish assignments from all six classes. “It was less intimidating on your mind; you didn’t have six or seven classes of homework every night,” said Meyer. The extra days to finish homework helps with time management: “[Block schedules] did help me prioritize. Those nights when you guys stay up late doing all of your homework, I was like ‘phew, math homework isn’t due for two days,’” Jernigan said. Making the switch from six classes every day to a college’s irregular schedule is not easy. Students are better prepared for college when they get the chance to experience a college-styled schedule in high school. “Standard scheduling doesn’t seem to represent the college lifestyle and I think it’ll be harder for students with standard scheduling to get used to the longer classes and having different classes each day,” Barber said. Now that we have Chromebooks, this would change. Communication is improved, making these issues less severe. From a student’s perspective, absences do not have the same effect: “It was much easier to attend full school days because every day felt different and it was a lot less monotonous. Also, if you were ever tardy for class it wasn’t a very big deal because classes were 90 minutes long, so only a very small percentage of the class was missed,” Sweeney said. The block schedule is now just an interesting part of WO history, but should WO bring it back? One indisputable factor is the high price. Block schedules require more teachers, thus staffing becomes more expensive for the district. But overall, there are considerable benefits of the block schedule: lesson plans are improved, homework is more manageable, students are more prepared for college.